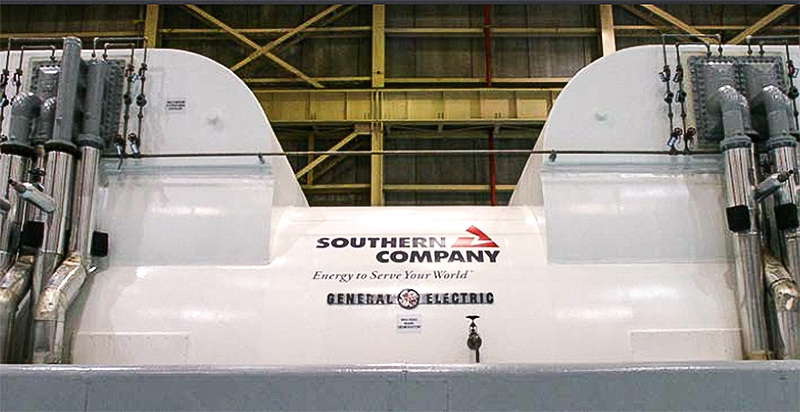 The generator for Unit 1 at the Hatch nuclear plant in Georgia is pictured. Southern Co. Inside the Edwin I. Hatch nuclear plant's Unit 1 reactor near Baxley, Ga., a small cluster of experimental fuel rods is undergoing a live stress test to learn whether their design could help prevent a nuclear accident from spiraling into a Fukushima-level meltdown. As the unit runs, powered by conventional fuel clusters, test units with new protective sheathing are hit with radiation and heat around the clock. The punishment will continue until 2020, when the reactor's next refueling occurs. Then operators will extricate the guinea pig assemblies and send them out for examination. For the nuclear power industry, facing a challenging future, these and other new fuel designs could enhance reactor safety and also lengthen the time between costly refueling for reactors in the next decade. In the bigger picture, nuclear power advocates say, the introduction of new technology will be critical in extending the life of the current U.S. reactors as a source of zero-carbon power generation, introducing small modular reactors suited to a slow-growth grid, and maintaining a U.S. presence in commercial nuclear power in the face of China's fast-moving advances. The search for new fuels is a front-and-center example of the Nuclear Regulatory Commission's "transformational" goal of speeding up its regulatory processes while giving the nuclear power industry more leeway to introduce new nuclear power technology. "We're at the very beginning of what I hope is the dawn of a new regulatory age [proving] that this industry can innovate," said Rod McCullum, an NEI senior director on reactor fuel issues. "Wind, solar and natural gas are innovating like crazy. We're still operating basically with our grandfather's nuclear plants. The reason for that comes strictly in how we're regulated." New designs for "accident tolerant" reactor fuel units, which were given a priority after Japan's 2011 Fukushima Daiichi reactor disaster, aren't expected to be ready for installation until the middle of the next decade. Even that timetable is at risk, however, unless the NRC moves faster and gives the industry more flexibility, McCullum says (Energywire, April 24). But to critics at the Union of Concerned Scientists, the NRC staff's willingness to ease regulatory requirements on the testing of new fuel assemblies is asking for trouble. The new units are called "lead test assemblies" (LTAs) in the NRC's lexicon. "For decades, [reactor] owners sought and obtained NRC's permission before they put LTAs in operating cores," said David Lochbaum, director of the Union of Concerned Scientists' Nuclear Safety Project. "Now, the NRC basically proposed telling industry, 'Just do it. No permission required.'" The immediate issue concerns the rules that apply when experimental fuel bundles are sandwiched into reactor cores along with new conventional fuel assemblies during reactor refueling, which takes place every 18 months to two years. The NRC staff has proposed to allow reactor operators to load experimental test units without prior NRC approval, and wants to document the new policy in a letter of "clarification" to NEI, the nuclear power industry's chief lobbyist. The proposed change has been followed by a parallel proposal by Victor McCree, NRC executive director for operations, called the transformation initiative. Its aim, as McCree noted in a May 23 letter to commissioners, is to change the commission's "regulatory framework, culture and infrastructure" to enable "the safe and secure use of new technologies." Behind the initiative is pressure from the industry, backed by members of Congress, to accelerate NRC approval of new reactor and fuel designs and control technology against a backdrop of early retirements of older nuclear reactors unable to compete with cheaper natural gas-fired generation. McCree's letter asks the commissioners to direct the staff to undertake four regulatory changes, including the proposed approach to test fuels. The NRC action would acknowledge that "a new technology may be safer than an existing technology," although it may lack a track record of years of safe operation. "We're heartened by the fact that the staff has recommended giving us more flexibility," McCullum said. Under the existing procedure, wholly new fuel designs under development by several vendors could not be installed without advance approval of the NRC, "and that gets into the mechanics of what you need to provide the staff to demonstrate that it is safe. And that almost goes to what individual [NRC] staffers want to see," he continued. "Everything is in the eye of the beholder." On this and other issues, the industry and its vendors want the chance to demonstrate that safety requirements can be met using computer modeling instead of as much physical testing, he added. "Certainly by the time you start putting entire [fuel] assemblies in there, and you start actually generating a significant amount of power with new fuel designs, you are going to need to be seeking NRC approval," McCullum said. "Absolutely." The need for swifter innovation is tied to decisions that U.S. reactor operators must make beginning in the next decade about whether to seek a costly operating license extension to keep existing reactors going out to 80 years, he said. Having approved new fuels on hand "is critical to the decisions on license renewals," he said. "It's not going to save any of the [nuclear] plants on the endangered species list" currently. Improved coatings on fuel assemblies are designed to give reactor operators more time to respond to emergencies before a meltdown occurs, slowing the generation of explosive hydrogen gas as fuel rods fail — the cause of the explosions that wracked the Fukushima reactors in 2011. A sturdier fuel package could also enable reactors to ramp power up and down, rather than being tied to a constant, 24/7 output as has always been the case. Then, reactors could play a larger role backing up variable wind and solar power, McCullum said. Lochbaum said he agrees that new fuel assemblies are a very important technology advance. But the changes proposed by the NRC staff aren't necessary, Lochbaum added. "They have the luxury of time," he said. The traditional regulatory approval for a test of a new fuel design cost around $50,000, and that isn't a deal-breaker, he added. Lochbaum pointed to an objection to the proposed change filed by a longtime NRC staff member, Harold Chernoff, who filed pages of reasons why the NRC should stick to its current process. The new fuel technologies "have never experienced conditions inside a real operating reactor," and the new designs should go through a safety review by the NRC staff before being deployed, to reduce the risks of malfunctions inside the reactor that could endanger plant operators, Lochbaum said. The commission should not cut corners with reactors "operating in American backyards and hoping all turns out well," Lochbaum said. The commission had been "sitting on" a change in its rules governing new fuel technologies, a policy proposal with 10 years of development behind it, he added. If the new rule isn't ready for prime time, then how can a "clarification" to NEI be acceptable? Lochbaum asked. "Accident-tolerant fuels have safety benefits. We're trying to get to those benefits in the right way," Lochbaum said.